As charming as it is tough, the Timber Wolf "Woodsong" Pocket Knife combines eye-catching, rustic allure with exceptional craftsmanship and performance. The result is a folder that's handsome enough for display, but so field-capable and gratifying to wield, you won't be able to resist the urge to brandish it and use it at every opportunity. A lot of blood, sweat and tears go into producing a knife of this caliber, but we think it's well worth the effort and time. Take the Damascus steel drop point blade: master bladesmiths painstakingly hand-forge every one, employing an ancient technique that involves repeatedly firing, folding and hammer-welding two distinct varieties of high carbon steel. Once the metals are inseparably fused, a final acid etching highlights the bold contrasts in the resulting layers. The process is slow and meticulous - often taking days and requiring the precision only a skilled artisan can offer. No mechanization. No automation. 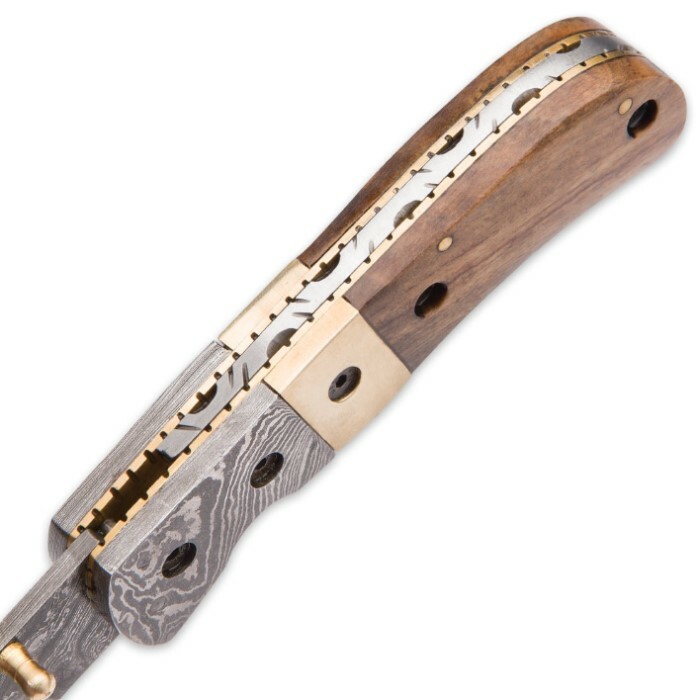 And like a snowflake, the patterning on each and every Woodsong blade is one-of-a-kind. 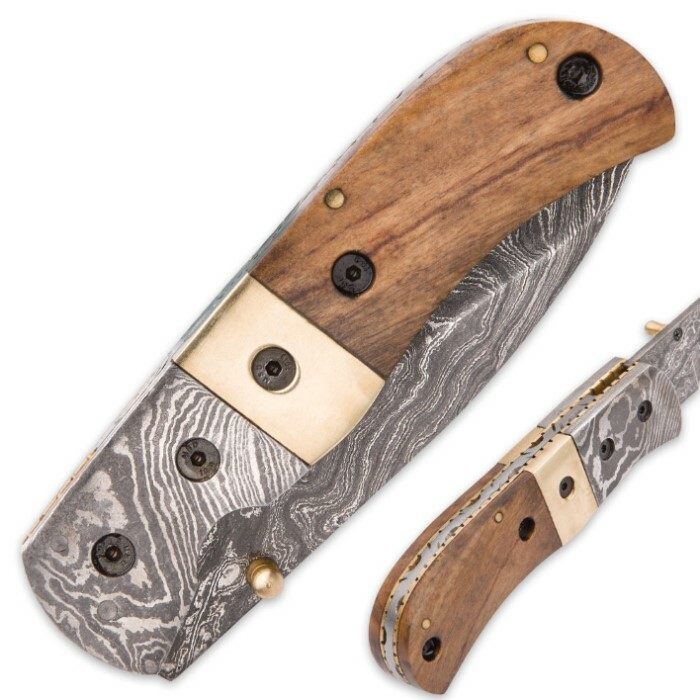 Brilliant gold-colored ambidextrous thumbstuds beautifully offset the breathtaking Damascus, while allowing for easy one-handed blade deployment. The Woodsong's rugged walnut handle is equally impressive, boasting warm umber hues and rich patterning of its own, created by the greatest master artisan of them all - mother nature. There's no question - this superb folder is a dazzling treat for the eyes, but using it? Well that's another matter entirely. Impeccably balanced with an intuitive, undeniably solid feel - wielding Timber Wolf's Woodsong is an experience that's simply beyond compare. It's satisfying. It's invigorating. It'll make you want to sing! 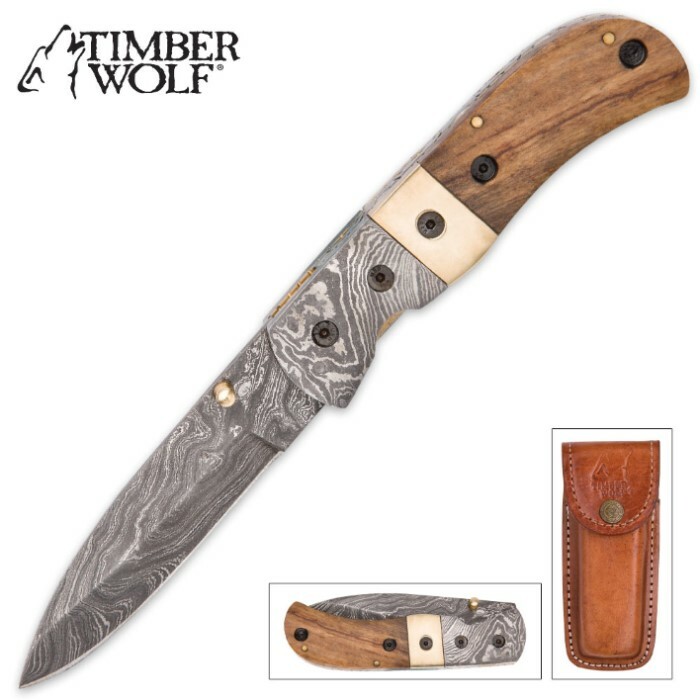 Hi, yesterday I submitted a review for this knife (the Timber Wolf Woodsong Damascus Pocket Knife). In the last paragraph, I wrote that the knife weighed 7.2 grams. Would you please change that to 7.2 ounces? (Big difference! :-) Thank you!